Way’s Packet Directory boat #5125. “Sternwheel packet, wood hull. Built Jeffersonville Ind., 1872. She entered in Evansville-Nashville trade with Capt. Josh V. Throop, master and George Throop clerk. Named for Col. Silverthorn river editor of the Evansville Journal. In 1877 owned by Evansville, Cairo & Memphis Steam Packet Co., Capt. George S. Throop, with Sid Humphrey, clerk. Was running Memphis-Hales Point, January 1880. Sold to New Orleans fall of 1883. 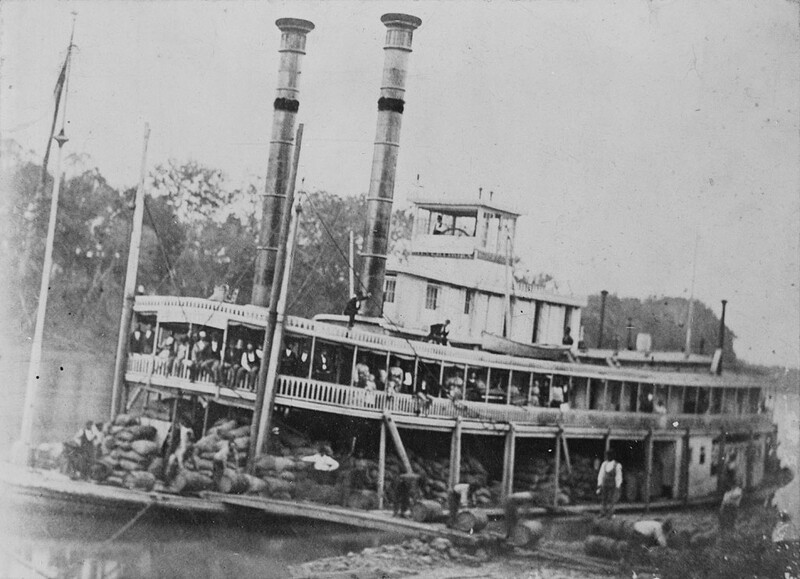 She was returned to Paducah in the summer of 1883 and was given cotton guards and went back south.” The SILVERTHORN is listed on a Lee Line poster showing Robert E Lee holding the reins to various steamboats and listing the boats the Lee Line owned. This is the only picture of the SILVERTHORN in the University of Wisconsin La Crosse collection and is used with their permission.